No more boring baths, itchy skin, and dry hair. Give your body the break it deserves and treat it to something sweet. LUSH personal care products are made from organic fruits and vegetables that smell so scrumptious, you will want to eat it (but you probably shouldn’t). Your skin will glow, your hair will shine, and your lips will be velvety soft. Enjoy the sweet smell of savings when you use a LUSH cosmetics coupon code on your next purchase. When you purchase LUSH soaps, shower gels, shampoos and hair conditioners, bath bombs, bubble bars, hand and body lotions or face masks, you know you are buying quality. LUSH cosmetics are made from fruit and vegetables, essential oils, honey and beeswax. Just because LUSH cosmetics are high quality, it does not mean you need to pay a high price. Below are instructions on how to apply and use a LUSH cosmetics coupon code. 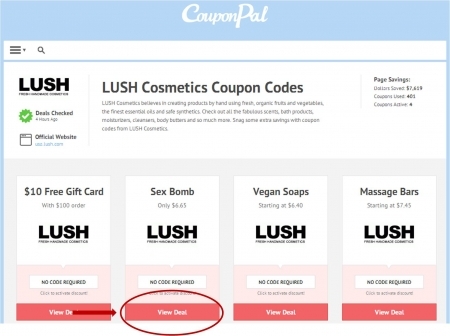 After locating the coupon or deal you want to use to purchase LUSH cosmetics, click the corresponding "View Deal" button on the Couponpal Website. A new window will pop open when you click on your button. After clicking the Couponpal "View Deal" button, a new window will pop open. It will direct you to lushusa.com. "View Deal" means there is no LUSH cosmetics coupon code and your promotion will automatically be applied when you click this link. Choose the quantity of the product you want to buy then click "Buy." Click "Checkout" to finalize purchase. 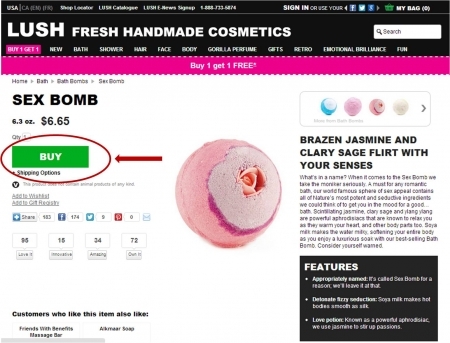 Make sure you have the right LUSH cosmetic items and their quantity in your shopping cart. 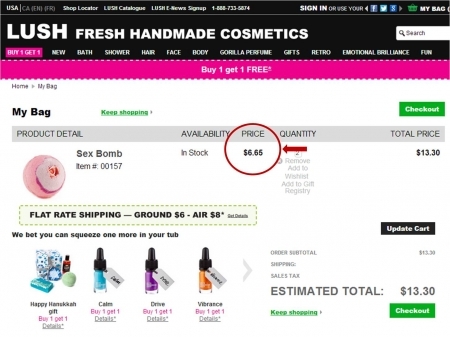 You will notice your LUSH cosmetics promotional price from the Couponpal website has already been applied. To advance with your purchase, click "Checkout." 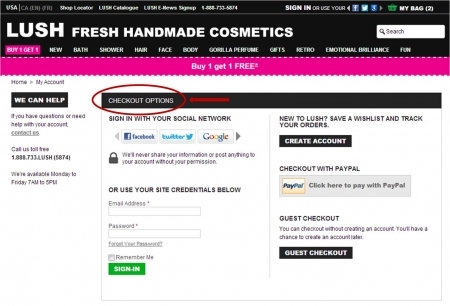 Sign in with a social network login information, create a LUSH cosmetics account, or checkout as a guest. Then fill in your shipping information, shipping method, billing information and then complete LUSH cosmetics order. If you had your choice between grandma’s home baked cookies or a store bought brand, which would you choose? Let’s face it – everything is better when it’s homemade. That’s why LUSH makes all of their cosmetics by hand, and use only fresh organic fruits and vegetables. They want you to feel as though your product was made in your grandma’s kitchen – because it practically was. LUSH makes each product in small batches, delivers it to your local store within days, and it will never stay on the shelf longer than four months. With all-natural ingredients like vanilla beans, grapefruits, and coconut oil, you will never want to use anything else again. Once you go LUSH, you never go back! Tame your mane with Big Shampoo, lather your skin with Dream Cream, and make your bath more fun with a ButterBall Bath Bomb. While LUSH products will make your outside feel soft and silky – their philosophy will make your insides feel warm and fuzzy. LUSH will never use animal fats in their products and only tests on willing humans. They are also strong advocates for animal rights and offer a range of ‘Go Green’ products. So after admiring your silky skin, go hug a tree knowing that you did some good for the world today. Originally operating as Cosmetic House Unlimited, husband and wife team Mark and Mo Constantine opened their first store in 1994. In April of 1995, they officially changed their name to LUSH. They now operate 438 stores in North America, Japan, and Australia. In December of 2010, Mark and Mo were awarded the OBE in the New Year’s Honours list for services to the beauty industry. LUSH also gives 2% of its profits to charity, and recently launched ‘Charity Pot’ moisturizer, of which all proceeds will be donated to causes such as the Dorset Wildlife Trust. CouponPal has blended together a LUSH cosmetics coupon code with a dash of velvety smooth discounts. Layer it on top of your next purchase and enjoy the scrumptous savings.